Book 3 in The Colony saga starts with a small band of humans still trying to out run the zombie horde which has taken over Earth. It took only a few hours for society to crumble but a few humans still managed to survive and this is their story. 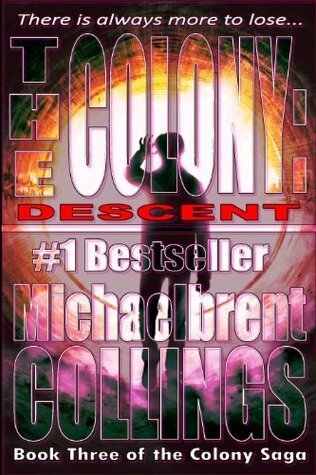 The Colony: Descent by Michaelbrent Collings is a story of hope, survival and zombies. Descent is just a little different then the first two books. The story begins with 8 people trying to get away from fast-moving zombies who are just as smart as the humans and can’t seem to be destroyed. The survivors have to run through an empty skyscraper and a wrecked aircraft but they finally manage to get to a safe place. There escape comes at a cost though, they are still trapped and they are not in good shape. They need food and medicine and they have no supplies. One thing that sets this book apart from the last two is it has a little humor and there is a little downtime for the characters. I liked the non stop action that’s in the first two installments and the first half of this book but I liked it that things slowed down in this one, you got to know the characters better and it sets up some really creepy scenes. The action picks up again towards the end and when the zombies find their way to the survivors it is one of the scariest things that I’ve ever read in a zombie novel. My favorite part of this story is the relationship between Ken and his wife Maggie. In a stressful time Maggie has turned against Ken but when things get harder they come together. There was one scene I liked where Ken sees two of the other survivors show affection for each other and feels jealous. Another scene I liked was when Maggie sees all the survivors working together and thinks to herself “my family.” I love how all the survivors work together against the zombies despite their differences. Descent also has one of the funniest lines that I’ve ever read in a book. After Ken has been passed out for a long period of time due to infection, he wakes up and asks how long they have been where they are and his daughter answers: “We’ve been here for seven poops.” I also loved the zombies who were trapped in the airplane and how decapitated zombie body parts start to come after the survivors in the sewer tunnel. Descent has some great moments, I think this was the best in the series and I’m glad there is a part 4 coming. This one may have less action but it is scarier than the others and all the characters really had a chance to shine. My only complaint about this book was that there are lots of questions that get brought up and I figured they would get answered in this one. Instead the book ends with another major cliffhanger. On the bright side I’m curious what Michaelbrent Collings has in store for the survivors. Considering how each book had something that made it more terrifying than the last one, I have to see what Michaelbrent Collings comes up with next.